Ed Purcell (Just Friends) advises that Don Haydon was a top racing skipper and that Dionis was just about unbeatable in her usual racing area - mid Long Island Sound. Stan Barnes (Shamon) told us this story. It seems that, during an Off Soundings Club race in the 60s, a crew fell overboard on a boat ahead. The boats were on a downwind leg carrying spinnakers and Don and Dionis' crew pulled off a very seamanlike rescue. They collapsed the spinnaker and, while passing the man in the water, Don leaned over and with the help of one of his crew together pulled the man aboard. They reset the spinnaker and went on to win the race in their Class. March 12, 2012. Breaking news!! Don is going on 80 and very much with us! Just because you spend your winters in Florida does not mean you have left the planet. He summers in Stony Creek, Branford. Your webmaster and Don talked and need to talk more. We have the following updated info about Dionis. She was named after the first (European/Irish) baby born on Nantucket - Dionis, a baby girl. Don had the boat about 5 years in the early 1960s and sold her in the late 1960s to a young guy from Fenwick/Old Saybrook, CT. 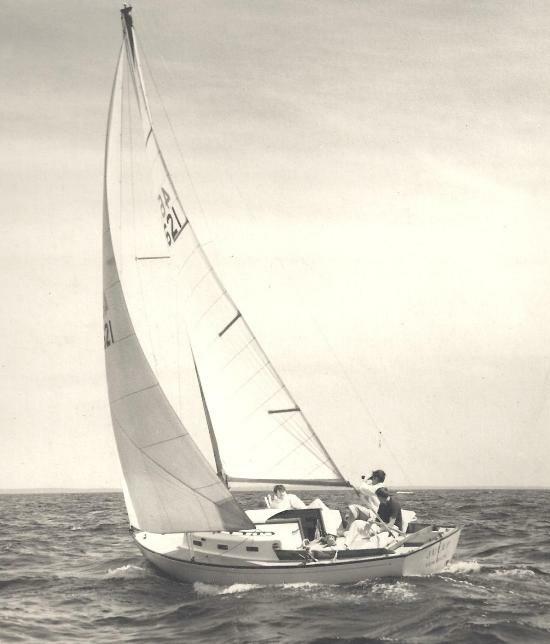 He had a lot of success racing with Dionis and remembers in particular winning the 1966 Sam Wetherill 93 mile overnight race, hosted by Essex Yacht Club, from the breakwater at the mouth of the Connecticut River, leave Block Island to port, and back (we'll look this one up). Dionis had a cutout in the leading edge of her bronze centerboard so it could get lower and forward of vertical - a climbing centerboard. He knew Bob Larson of US Yachts and remembers the organizational meetings Bob held for the Dolphin 24 Class at his apartment in New York City. Dionis, sailing with her new crew, and new name, Julep. March 18, 2012. While we knew Sam Jones lived in Fenwick, and bought his Dolphin, Julep, in the late 1960's, up until now we did not know where Julep came from, and we did not have a hull #. December 14, 2013 Dionis, became Sam Jones' Julep, and then became Peggy Benkard's Sloop du Jour. 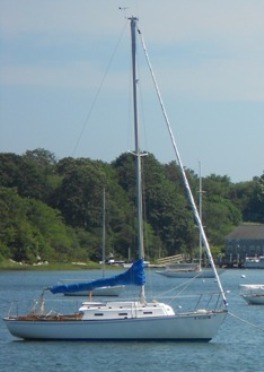 Here's a teaser photo of her taken in July, 2013, on her mooring at West Harbor, Fishers Island, New York. Click here to go to go over and say hello. Your webmaster was doing some research on Dolphins at the Mystic Seaport Museum's Blunt Library and decided to check out that early 1960s race that Ed Purcell reported on in the first paragraph. It was actually the Spring Series Off Soundings regatta in 1963 and it was pretty much a Dolphin 24 show. There were 42 competitors racing in this class. Dionis was 1st overall, George Sosman in Mei Mei was 2nd overall, and Ed Colie in Sambo was 3rd! Dionis was also 2nd in the 1965 Spring Series (41 boats) and 3rd in the 1965 Fall Series (25 entries). To read more about how Dolphins fared in racing 35-50 years ago, click here.